The remains of a mammoth have been found under the streets of Walworth and there is evidence of human occupation since the Stone Age. Walworth – ‘the enclosed settlement of the Britons’ – grew up between what became Kennington Park Road and the Old Kent Road, two of the ancient roads fanning out from London Bridge to the south coast. Canterbury Cathedral was a large landowner from the late Saxon era onwards. Walworth was long a rural area producing fruit and veget­ables in abundance; one local nurseryman had a list of 320 varieties of goose­berries. In the mid-17th century there were only a few houses along what is today Walworth Road but growing numbers of tradesmen set up shop here as traffic from London increased. Walworth Common was one of London’s most popular cricket grounds in the early 18th century. After it had been ejected from its pitch at Walworth in 1844 the Montpelier Cricket Club leased 10 acres of market gardens in Kennington, creating the ground now known as the Oval. One of the grandest surviving examples of Walworth’s early devel­opment is Surrey Square, built in the 1790s by the architect Michael Searles, who also built the Paragon in Blackheath. The mathem­atician and astro­nomer Charles Babbage – inventor of a forerunner of the computer – was born in Crosby Row (now Larcom Street) in 1791. 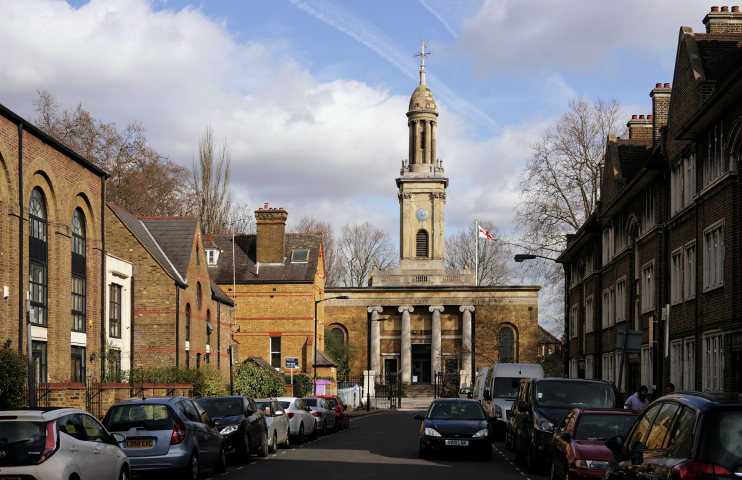 Shown in the photo­graph above,* St Peter’s church in Liverpool Grove was built to a design by Sir John Soane in 1825 to serve the rapidly growing community; over the course of the 19th century, Walworth’s population increased eightfold, reaching 122,200 in 1901. 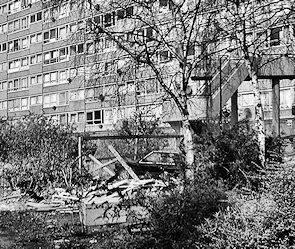 Great areas of Walworth were rebuilt after the Second World War, notably in the form of the massive Heygate and Aylesbury estates, which were planned in the 1960s and completed in the 1970s. The Labour Party’s headquarters were in Walworth from 1981 to 1997, when it moved to Millbank. Its Walworth Road building was renamed John Smith House, after the party’s former leader. The building has recently been converted to a stylish hostel. Tony Blair visited the Aylesbury estate soon after Labour’s 1997 election victory but a vote by residents brought a halt to its regen­er­ation. More recently the government withdrew funding for a private finance initi­ative project. Some new homes have been built but the council is seeking a long-term devel­opment partner to help it take the estate’s rehab­il­it­ation forward in a less piecemeal way. The Heygate estate is presently being redeveloped as part of the regen­er­ation of the Elephant and Castle, due for completion in 2025. The Cuming Museum, located in the old town hall building at 151 Walworth Road, was founded on the personal collection of Richard Cuming and his son Henry, and has been supple­mented by relics unearthed during excav­a­tions in the Southwark area. The building was very badly damaged by a fire in March 2013, probably caused by roofers using a blow torch. Many exhibits were lost but the council plans to reopen the museum – and to create an enhanced library and a new flexible space that can be used for community events, exhib­i­tions and perform­ances. However, this will take at least until 2019, assuming the scheme can proceed as hoped. In the meantime, all the museum’s staff have been made redundant. The largest ethnic groups in the area are of white British and black African origin. Formerly noted for its robust working-class community, Walworth (like Newington) is losing its identity as newcomers regard it simply as part of ‘the Elephant and Castle area’. The comic actor and film director Charlie Chaplin was born in East Street in 1889, the son of music hall entertainers. * The picture of Liverpool Grove at the top of this article is slightly modified from an original photograph, copyright Peter Trimming, at Geograph Britain and Ireland, made available under the Attribution-ShareAlike 2.0 Generic Licence. Any subsequent reuse of that image is freely permitted under the terms of that licence.